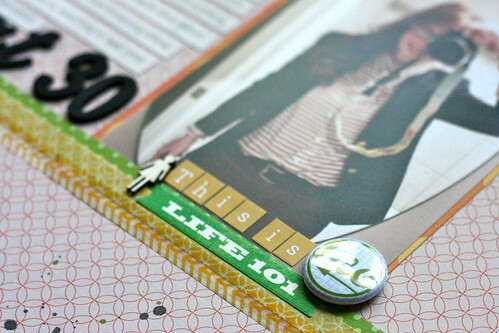 The July kit went live at The Paperie this past week but I haven't shared the layouts I created here on my blog. Honestly, it feels like ages since I created these because I had them finished and submitted to the store in mid-June! 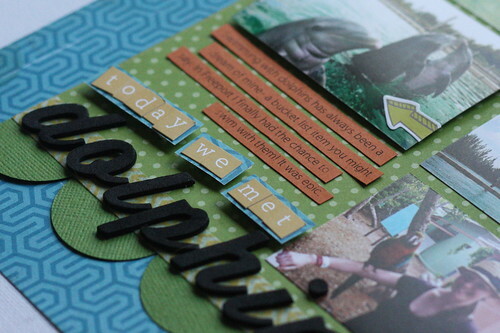 First up, a layout about meeting dolphins. Yep we did. While we were in Freeport, Bahamas in May we crossed something off my bucket list. It was so cool. 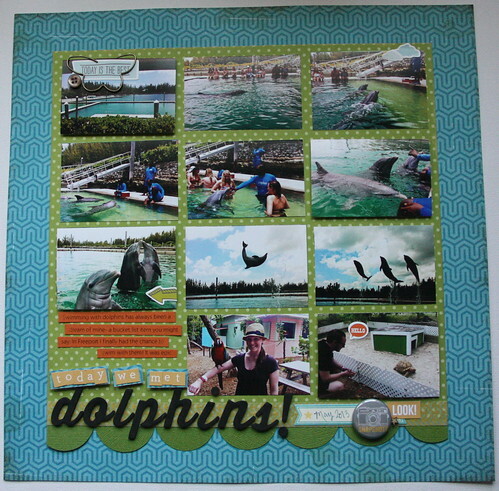 The papers in this kit were perfect for these pics of the dophin encounter. I threw in a little orange for a pop of color. A little adventure with our friends at 3 Pond Barron produced some great pics and a fun story-let's just say that Eugene's buddy really, really liked him! 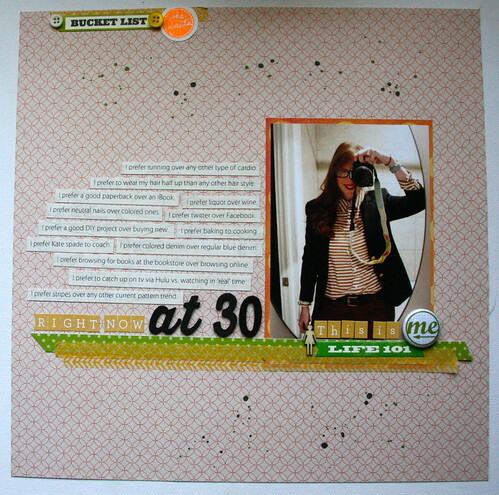 ;) So, I wanted to use a repeated circle element here to match the paper and I had already used the green cardstock to create circles for the scallop at the bottom of the previous layout. So, I rolled with it. I loved the way all the pics fit perfectly- I trimmed down the photos from little 2" pics- and added a little pattern paper and a badge in one circle. 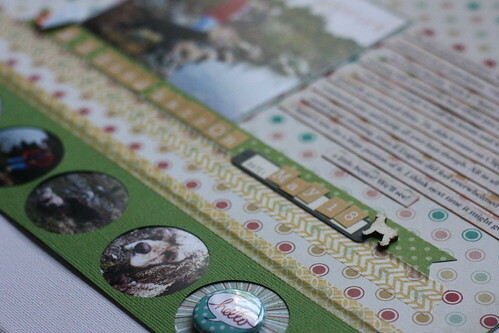 I also added a little wood veneer doggie because it suited the page so perfectly! The journaling for this layout was written on my birthday on my ipad. I wanted to chronicle where I was one that date. The pic was taken on June 1st for my birthday dinner. I love the orange + green + yellow combination. I love that the three layouts above have something in common but are also very different. 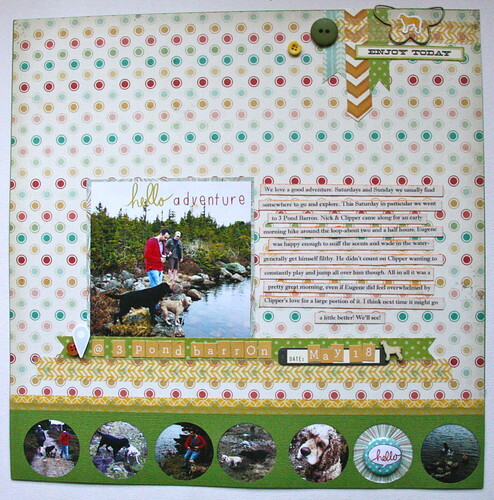 The Paperie is awesome at creating kits that enable you to produce a number of different pages yet all come from the same group of products. They recently announced they are going to take their card kit monthly so there's truly soemthing for everyone now! 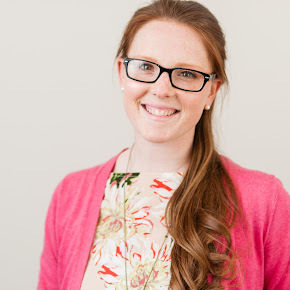 Check out all the details on their blog! Speaking of the store-I'm teaching a kids class tomorrow using Amy Tangerine's daybook with a ton of techniques. There's still room to sign up so if you're interested call the store. Stay tuned tomorrow for the rest of the layouts!